Soma Houseboats offer many cruises connecting the main backwater destinations of Kerala. 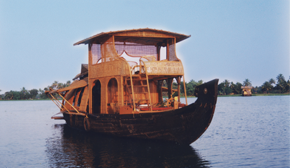 Alappuzha (Aleppey), one of the most popular destinations, forms the starting point for most of the cruises. 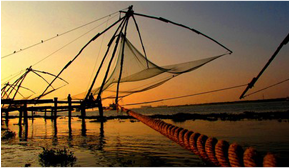 The shortest trip involves a tour of the nearby places in Alappuzha and Kuttanad regions and the longest trip covers many fascinating places and regions along the length of the backwaters. Thekkady, the land of unending charms of hills and spice scented plantations. It has the famous wild life sanctuary in south India and which is also a Tiger reserve. Attractions; Boating,Trekking,Elephant ride etc. Queen of Arabian sea has one of the finest natural harbors in the world. The ancient churches, palaces, synagogues in the city are sought after by archaeologists and historians. Attractions: Dutch palace (closed on Fridays),the Jewish synagogue (closed on Fridays & Saturdays),St.francis church, said to be India’s oldest European built church etc. It’s a cluster of little island on the Vembanadu lake with a wide variety of flora and fauna. Attractions are bird sanctuary can be visited by canoes, houseboats etc. The most beautiful hill stations on the western ghats at about 7600 mts above sea level. Anamudi the highest peak in the South India is near the place. 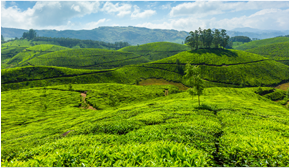 There are lakes, reservoirs, forests, several teas estates and cardamom estates. 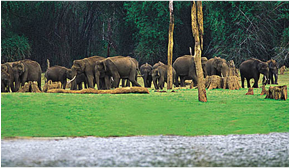 Attractions: Wild life sanctuary in the Eravikulam National Park, Rajamala area, Chinnar wild life sanctuary. 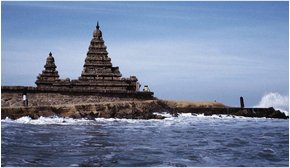 Interstate Tours to Tamil Nadu,Karnataka and North India. Tamil Nadu is the land of Tamils and it has a history that date backs to several thousand years.It is a land where traditions and culture blends and continue to live in harmony.The state abounds to monuments and temples that are ancient an eachhas it’s own story of religious,artistic and cultural accomplishments and specialty waiting to be heard. 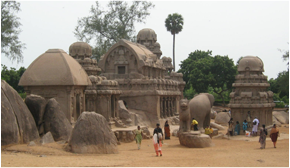 Mahabalipuram was once a flourishing part of Pallava dynasty of India. The monuments and sculptures in Mahabalipuram are world renowned and attracts to tourists all over the world.Morning attraction: Shore temple, Arjuna’s penance, Artisan’s village.Kaanchipuram, the city of thousand temples considered as the second holiest place in South India and one of the seven sacred cities. It was successively the capital of the Pallavas and Cholas. This place is also famous for hand –woven silk fabrics. 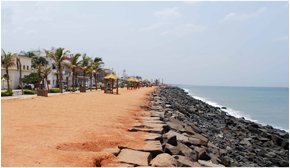 Pondicherry is a charming coastal town with a few enduring pockets of French culture and an Ashram. Attractions: Auroville, Pondicherry museum and the Botanical garden. Swamimalai En route, Visit,Gangaikondacholapuram and darasuram. Attractions: Tanjore.It was once the capital of Chola dynasty of temple builders who ruled south India between 10th`14th centuries. Visit the most spectacular Brihadeeswara temple,capped by a monolithic cupola made of a single granite rock weighing 80 tonnes. 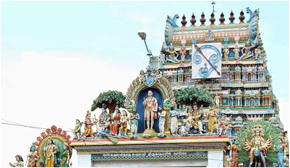 The temple itself is decorated with carved panels depicting mythological events. Later visit saraswathy mahal library and art gallery with a large collection of Chola bronzes – a unique example of Hindu architecture.